Robot Operating System (ROS) is a software framework for mobile robot software development. ROS provides standard operating system functionality such as hardware abstraction, low-level device control, implementation of commonly-used functions and message-passing between processes. ROS is released under the terms of the BSD license, and is open source software. It is free for commercial and research use. ROS is licensed under a variety of open source licenses. 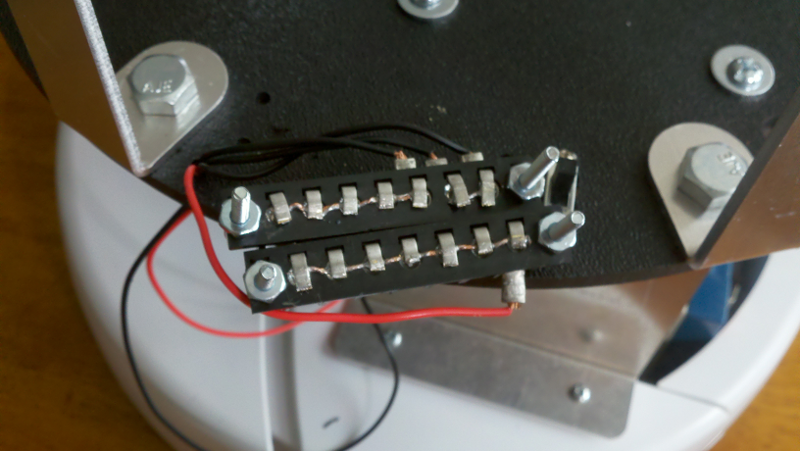 First, the gyro board and Create mounting bracket were installed. The Gyro board simply plugs into the DB25 Create expansion port. The mounting bracket is held in place by (4) #6 machine screws over the cargo compartment. 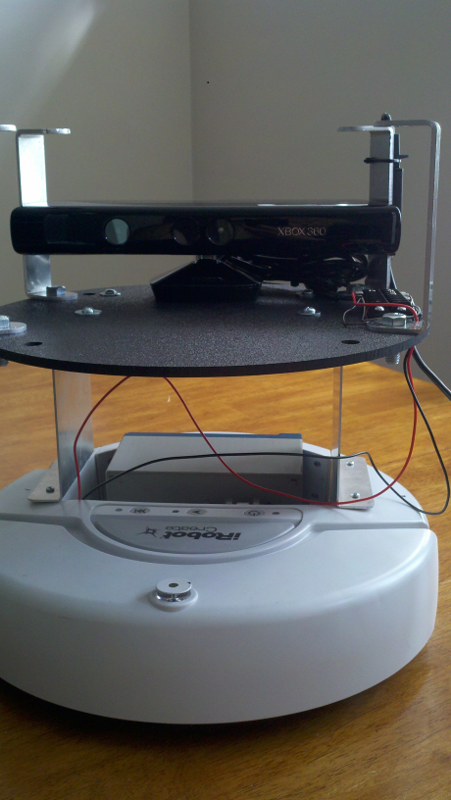 The primary sensor for this robot is the Microsoft Kinect. 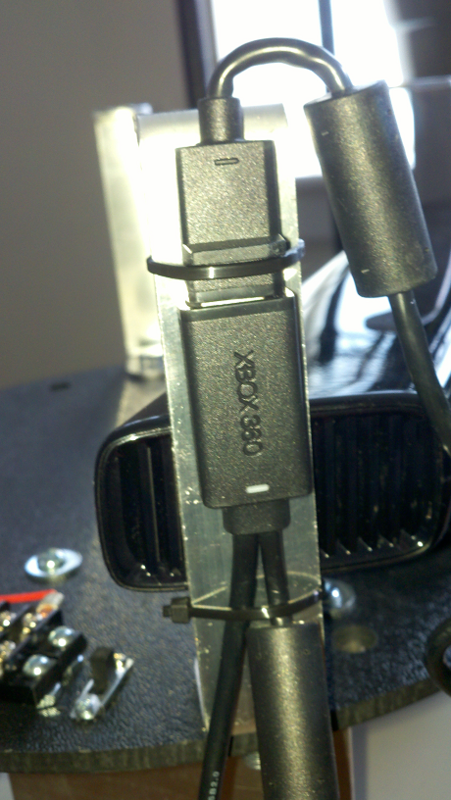 The Kinect power supply cable needs to be modified to run off the robot's 12vdc power supply vs 120 VAC. 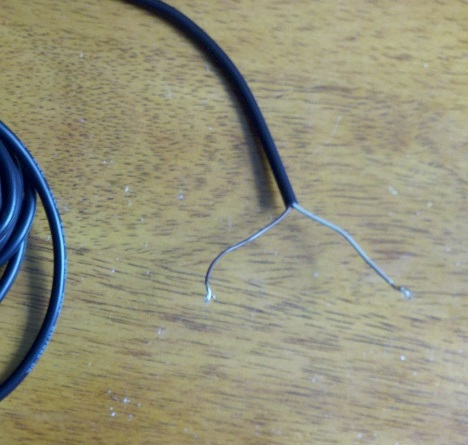 Cut the kinect power wall plug off kinect and strip wires (Brown- positive White-negative) The voltage should be confirmed with a multi-meter to avoid destroying the Kinect sensor. The Kinect sensor will be DESTROYED if the voltage polarity is reversed. Some 3rd party Kinect power cables may have different color wires. 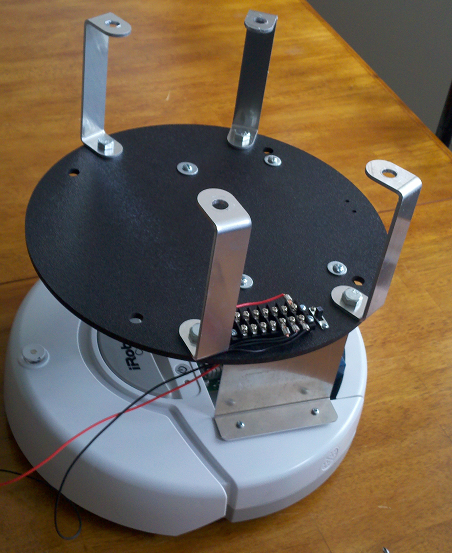 Zagros Robotics black ABS 12 inch circles and 5 inch mounting brackets are used for the additional decks. The lower deck is bolted to the Creat mounting bracket with #10 screws and is approximately centered on the create. The second deck is mounted with the 5 inch mounting brackets. A power distribution terminal strip is mounted on the first deck. The Zagros Robotics power distribution board could also be used for this function. 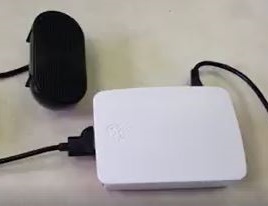 This provides easy access to the 12vdc to drive the Kinect Sensor or any other sensors added to the robot in the future. A power switch was installed next to the power strip between the power strip and the external rechargable battery. 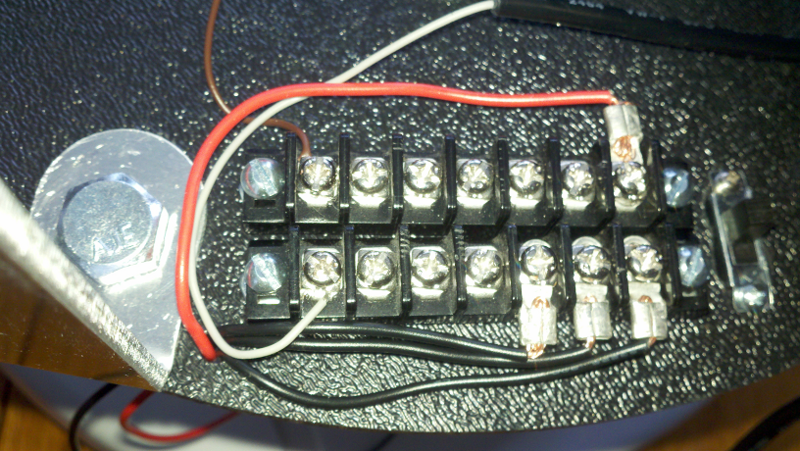 A standard terminal strip was modified by soldered a bus for ground and 12vdc sides down each side. 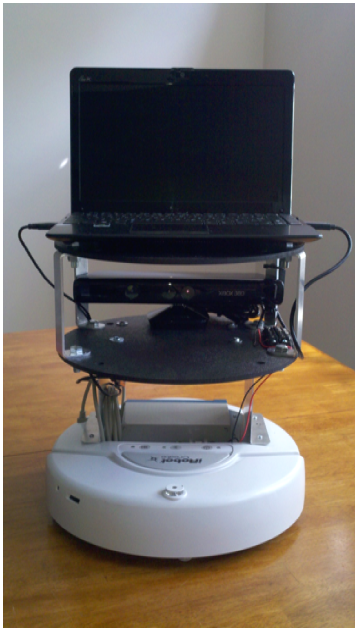 The Microsoft Kinect was placed lower deck and aligned with the brackets toward the rear of the robot. 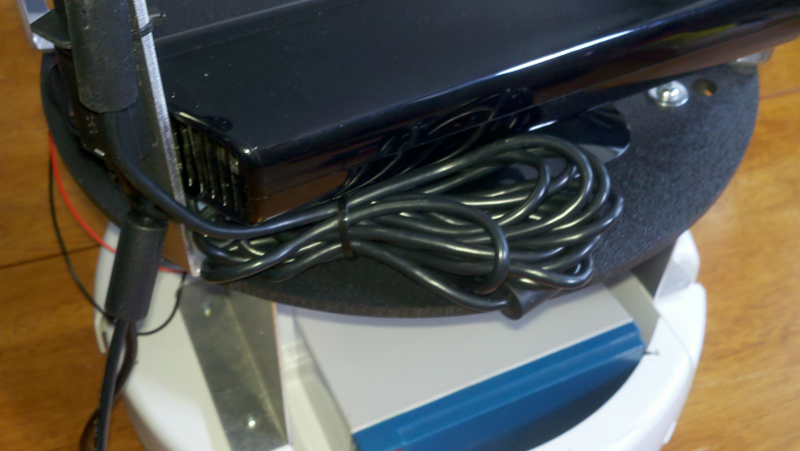 The Kinect and wires are held in place with zip ties. 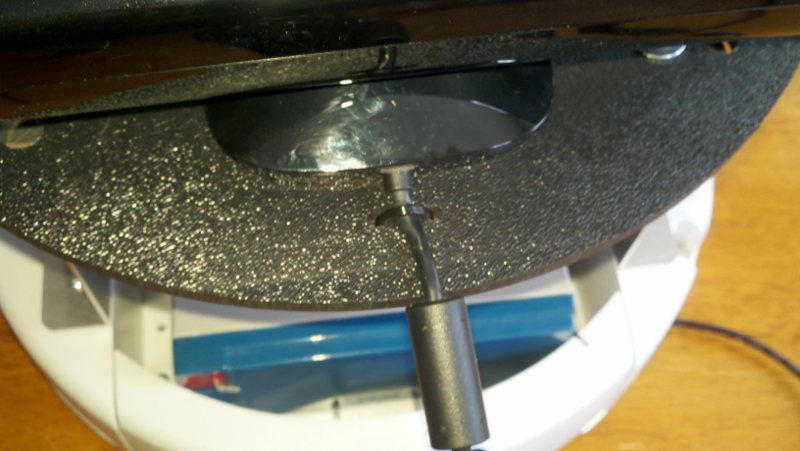 The Kinect power cable is zip tied to the left rear 5 inch bracket. 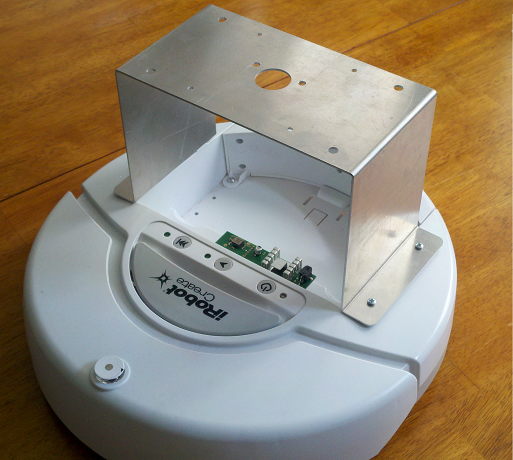 The rechargable battery is placed in the Create cargo compartment and is wired to the power strip on the first deck. 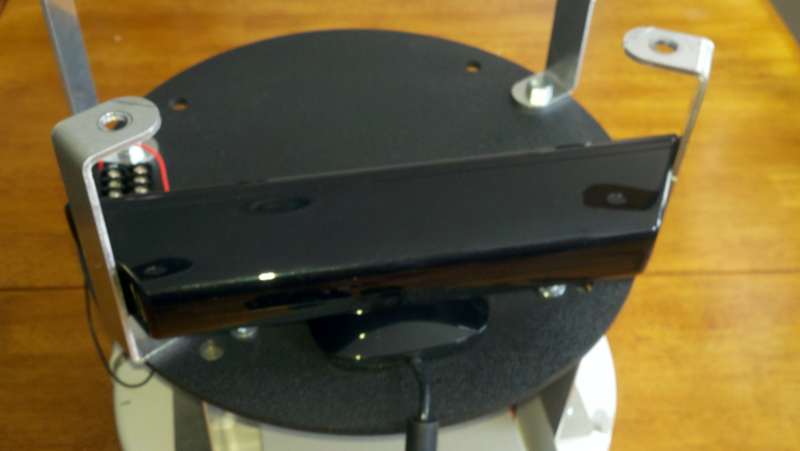 Confirm the Kinect is firmly mounted, level and facing straight forward.